The surf board is an essential part of a surfer’s interaction with waves. Some might say it is the spiritual connection between the surfer and Mother Nature. The size, shape, and style of the board reflects both the surfer’s personality and approach to wave riding as well as the trends in board styles and design over time. A surfer’s collection of boards, their quiver, is an array of strategies for the type of waves they might encounter. My own journey began in spring 1970 after I turned 13. 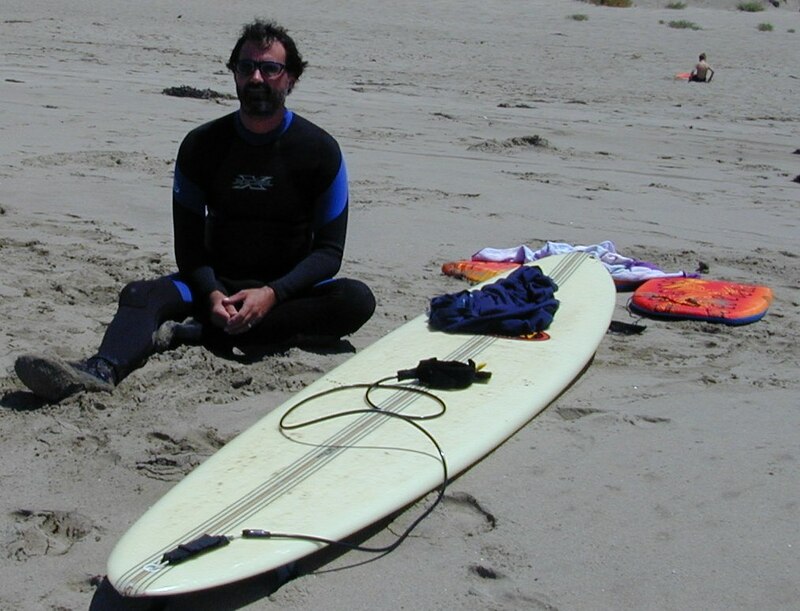 Although I had surfed “foamies” (foam boards) as early as 1966 in Pacific Beach (CA), my mother would not let me use a real surf board until I turned 13 for fear of “hitting my head on the board and drowning.” So, when I finished 7th grade in 1970 I began my surfing career. Here are most of the boards I have owned in my life. [for a narrative to go with these pictures check out Coming Home]. 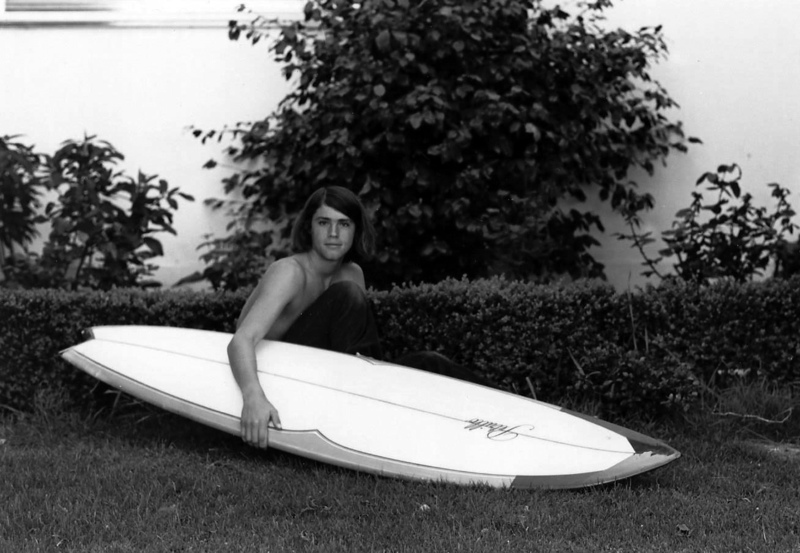 My first board at Pacific Beach, early summer 1970: an 8′ 6″ Hansen Mike Doyle pintail with a boxed in fin. 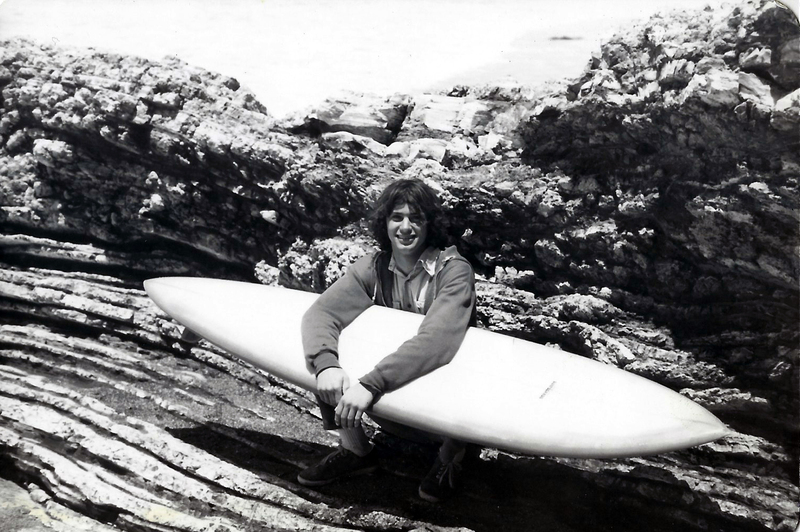 I learned to surf on this board and spent the entire summer of 1970 with Neal Unger learning to ride it. It was a great starter board. 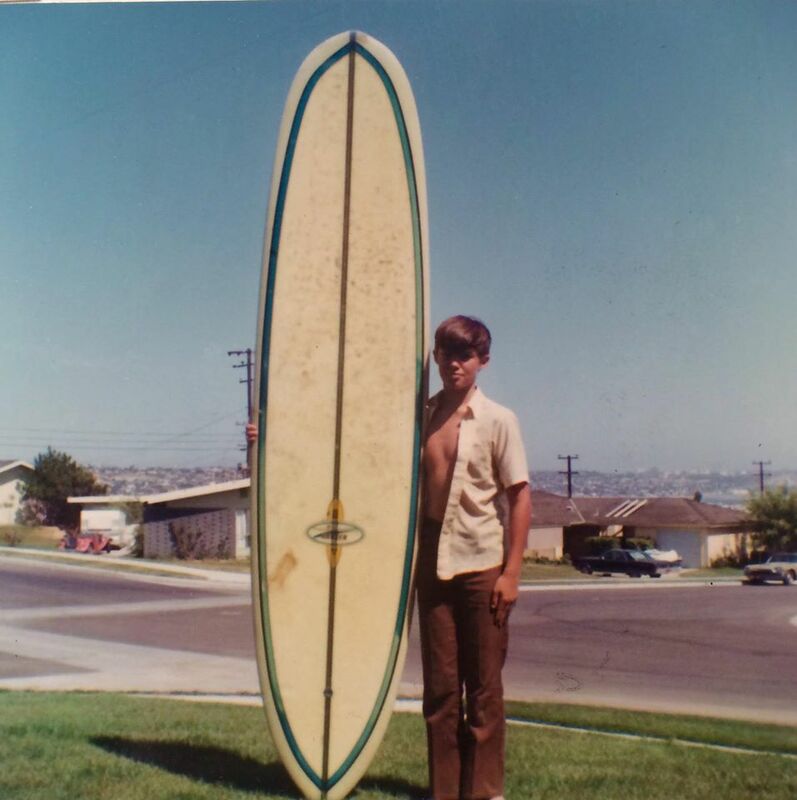 My second board, a 7’8″ Sunset gun, Fall 1970. 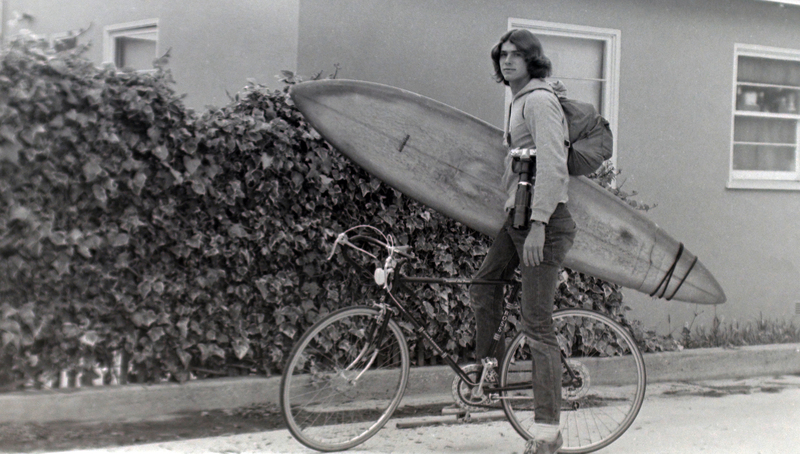 I had a San Diego Union paper route which paid for my first wetsuit, a Body Glove, and the board. Without a wetsuit surfing was limited to the summer, even in San Diego. I loved that board but it was way too big for the surf I was riding at the time and I was too much of a Grom to control it. Another shot of the board with my dog, Soda Pop, 1970. I live about 15 blocks from the beach and rode my bike with my board to go surfing. 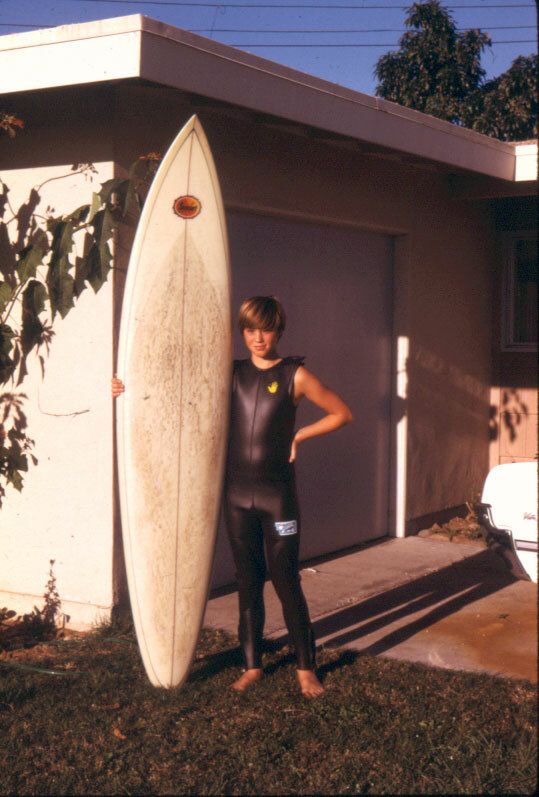 My 5′ 10″ twin fin in 1971. Fun but challenging. While I was learning to surf and experimenting with longer boards, surf boards were getting smaller and my next board was a 5′ 10″ twin fin. I loved that board but it was difficult to ride. No long drawn out lines with this one or a fin would track and you’d fly off the board. Instead you had to whip it around and keep it moving. Fun, but not my style. At that time the first leashes came out and early versions were just a long rubber hose with a suction cup, which I put on the nose of the board so I could whip it around. The rubber hose (by itself) didn’t last long due to the obvious boomerang effect so it wasn’t long until the hose had rope inside to limit the pull and we attached it to the back of the board like it is today. I still remember what it was like following a wipeout: of being on the surface with my board 10-15 away stuck in the backwash, hose stretched to the limit, and waiting for it to come flying back! I got rid of it and didn’t use a leash until a few years later when I moved to the Bay Area where cold water and rocky cliffs made a leash a high priority. 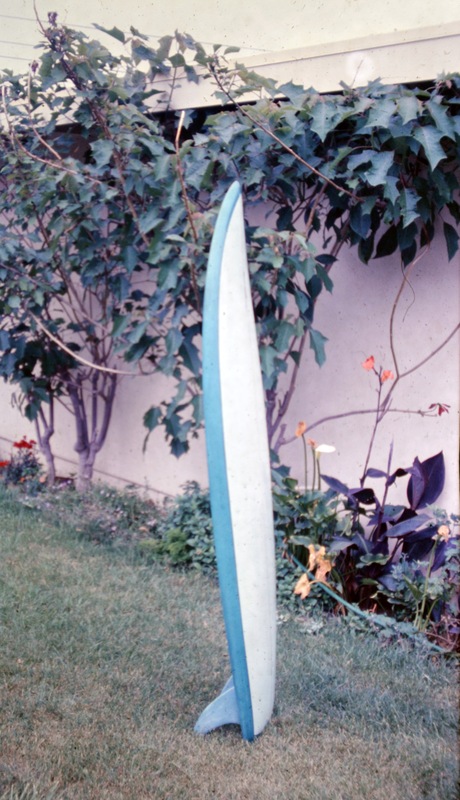 My Petrillo single-fin swallowtail, 1972, in Alameda, CA. I rode that one for many years. With my Petrillo, camping at New Brighton State Park, near Capitola, CA, 1972, with Jeff Chamberlain. 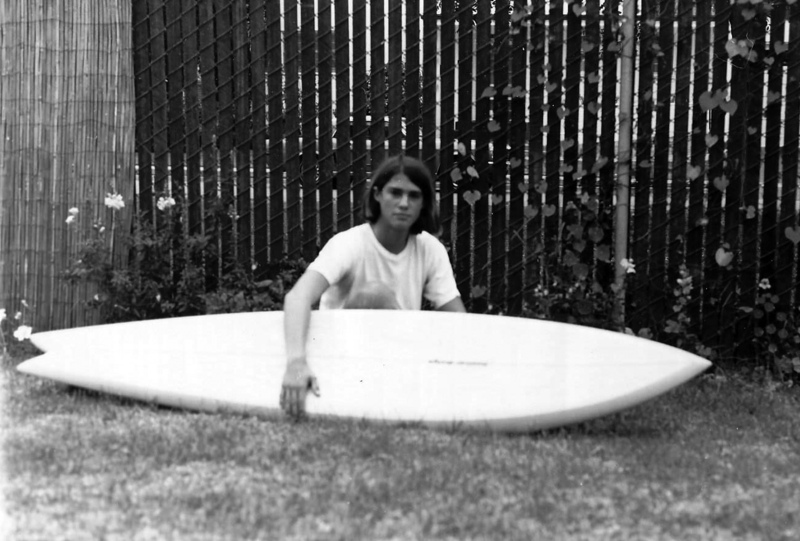 My fifth board in 1973, Alameda, CA. Swallowtail single-fins were common at that time. 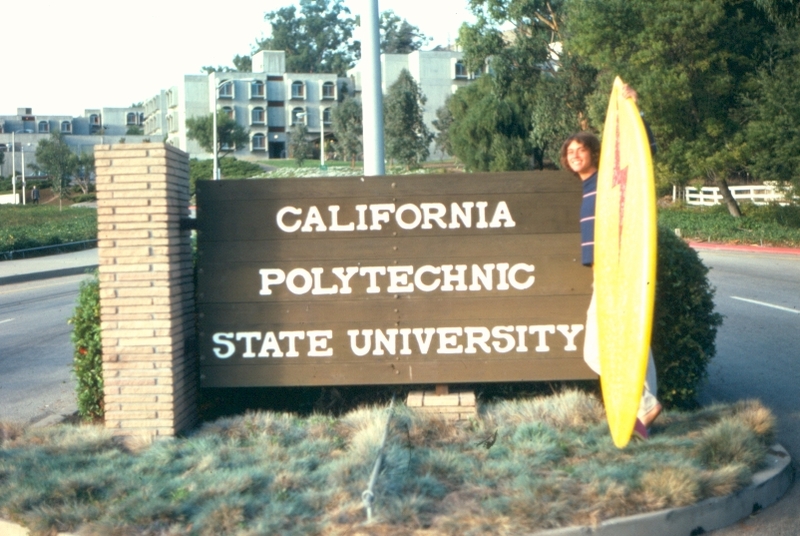 My 7′ 2″ Lopez Lightning Bolt, Fall 1975, when I started college at Cal Poly. I loved that board and rode it for several years. See Best Years of my Life, 1975. Riding my Lightning Bolt in Shell Beach, CA, 1976. 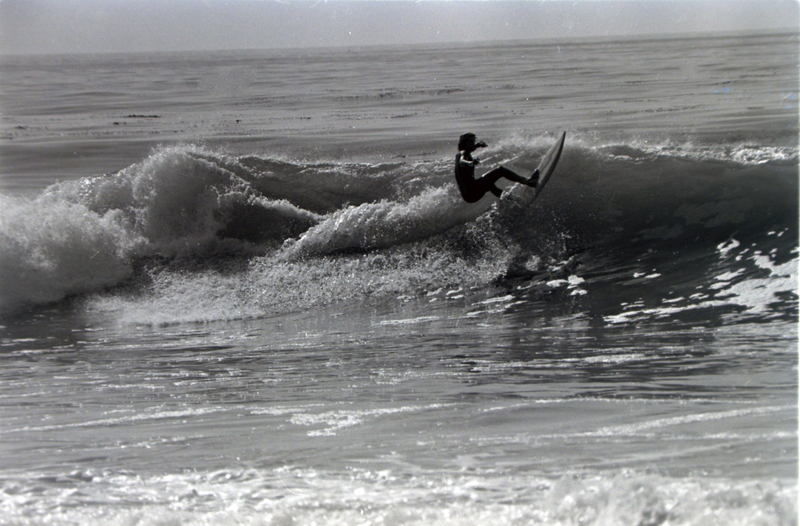 Shell Beach, 1976, near Little Sewers, my favorite left break in San Luis Obispo County. 5 min from my house. Make unknown. Same board in 1977 at our house in Shell Beach on Morro Ave. The tail was nearly broken off at Fuller’s during the monster summer swell of 1976 when my leash pulled through the tail. 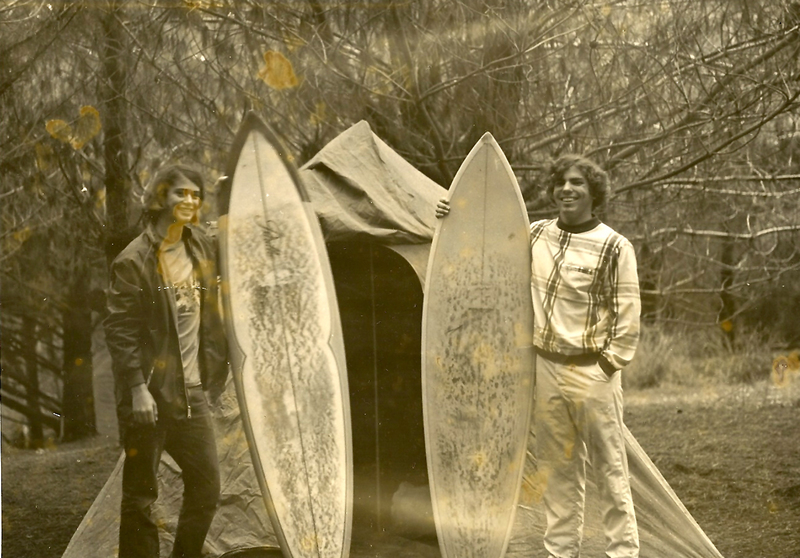 This is the only picture I have of a custom board I had made in San Luis Obispo in late 1977 for my trip to Hawaii and Bali. I believe I had it made at Central Coast Surfboard and it was a 7″ + gun. 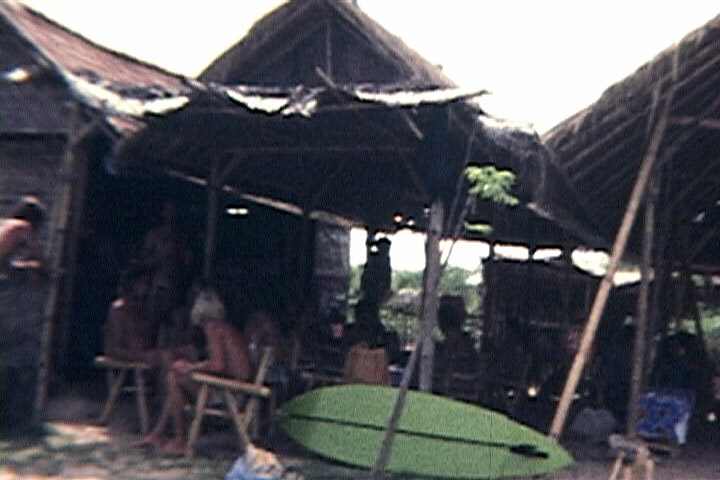 It is shown here at a drink shack at Nusa Dua in Bali, 1978. I also surfed the north shore of Hawaii over Christmas of 1977 including Laniakea, Haleiwa and Pipeline. For more on my trip to Bali read Surfing Bali in the 1970s. 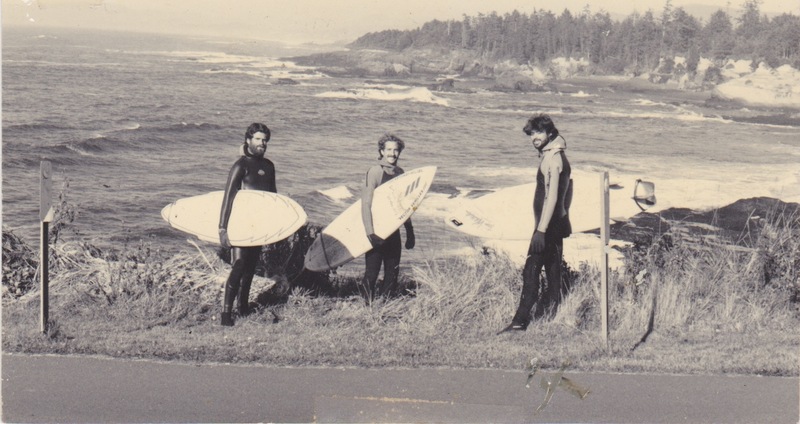 Oregon Coast, 1987, with Mark Hixon and Dave Booth at Boiler Bay. We surfed the inside break where “The Slab” is today. 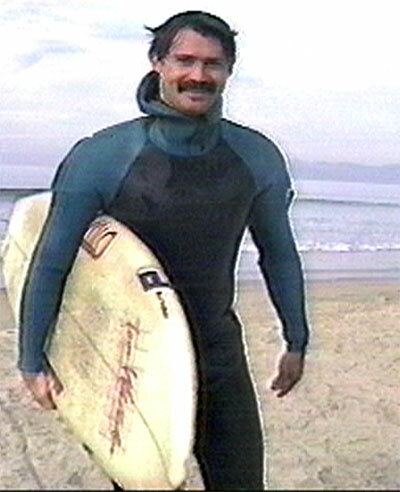 I think my board was made by Tom Whitaker, which I bought in Laguna Beach in the early 1980s. 1988 Oregon. Same board as above. My Current Board, an 9’4″ Orchidland Board bought in Hilo in 1997 made by Stan Lawrence. I great board to ride! ← Shark Attacks and the Surfer’s Dilemma: Cull or Conserve? This is such a fun post! We are just at the beginning of our lifelong exploration of surfing and pictures like this just make me want to hit the beach. Enjoy! Thanks Lauren, glad you like it. I wish I could do it all over again so have fun!